GYRR members are always looking for a new challenge, somewhere different to run and hopefully bag a PB. Anna Coulborn went quite a few thousand miles further than most to achieve her new marathon PB by travelling all the way to Perth In Australia! Anna reported that it was a beautiful course running along both sides of the Swan River. She noticed how clean, fresh and brand-new everywhere looked. 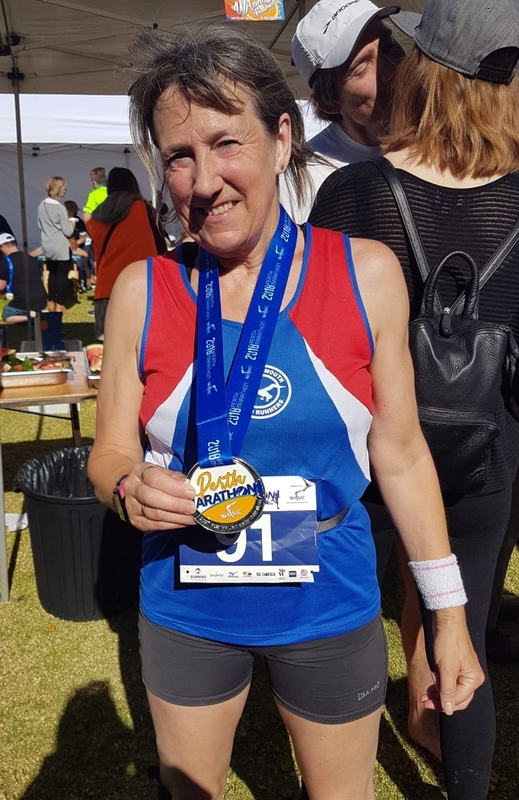 Despite it being winter in Perth, Anna enjoyed clear blue skies and sunshine with temperatures reaching 23 degrees C.
Running with two local ladies, Mary and Sophie, gave Anna such motivation and pushed her on to achieve a new PB of 4.15.46. This is an impressive time as Anna has recently been suffering with an injury. She also came 3rd in her age group! 750 entrants took on this small marathon with 697 finishers, some of which were part of a marathon relay team. First man home was a 51-year-old - Shaun Creighton in 2.32.12 and first lady home was Rochelle Rodgers in 2.44.45 in the 30-34 age group. Congratulations to Anna and thank you for putting GYRR on the map in Perth! Report by Penny Studley with contributions from Anna Coulborn.